Swiss chard is part of the beet family. The leaf color of Swiss chard is usually green but its stem comes in many different colors. This is why it is sometime called the rainbow vegetable. 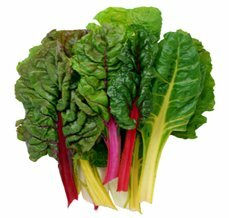 The flavor of Swiss chard is somewhat similar to beets and spinach. The word "Swiss" was used to distinguish chard from French charde or chardon by nineteenth century seed catalogues publishers and the name stuck. Chard is very popular among Mediterranean cooks but the first varieties have been traced back to Sicily. In the US the leaves are valued while European cooks value the stalks to the point of discarding the leaves or feeding them to animals. Chard is extremely perishable, so keep refrigerator storage time to a minimum. Store unwashed leaves in plastic bags in the crisper for 2 to 3 days. The stalks can be stored longer if separated from the leaves. This vegetable is very high in vitamin A and K. One cup of fresh Swiss chard can contain over 300 percent of the daily value of vitamin K. Swiss chard is also high in vitamin C, magnesium, manganese and potassium, and is a good source of iron, vitamin E, dietary fiber and copper.